People and trees growing bridges together. The Banyan tree (ficus benghalensis) grows aerial roots that turn into woody trunks once they reach the ground. 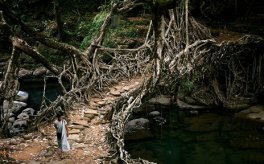 The Khasi are indigenous people of Northeast India who grow living bridges and ladders with these trees for the past 500 years and have connected their villages by a network of hundreds of living bridges. Stories of people and plants. A growing collection of books travels with the E.B. Station. They tell about ethnobotanical science and history, astronomical rhythms of planets, and of social, political and spiritual fiction and non-fiction stories of man and plant. 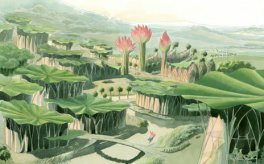 Due to both the water-repellent properties of its leaves and the qualities of its internal structures, the lotus is a source of lessons which cannot be avoided nowadays. Its resistance to harsh extremes of weather and its physiological properties provide so many ways to explore for adaptation and for creating new materials and functions. How to pick a screaming plant. 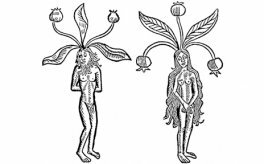 An old tale that tells about the intricate and amazing procedure of harvesting a mandrake plant. The saga tells of congenital thieves to whom stealing comes naturally. This happens when a man has descended from a long line of thieves or when a person has become a thief because his mother stole while she was pregnant. In this instance he has at least an overwhelming desire to steal (according to others, when an innocent man confesses to thievery under torture) and he is a pure youth but is hanged for the crime and waters the ground with his seed (aut sperma in terram effundit), then the mandrake plant or Gallow’s Man grows at that spot. 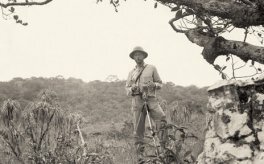 Ethnobotany (from “ethnology” – study of culture and “botany” – study of plants) is the scientific study of the relationships that exist between people and plants. Of migrating people and plants. What happens when people from communities with traditional healing practice move to globalized metropolitan areas? 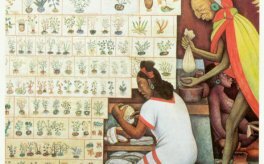 In New York and other U.S cities, Latin American immigrants formed an alternative health care system based on knowledge and plants native to their home countries. 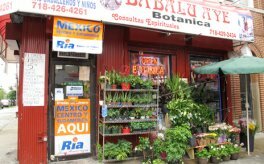 The shops where people gather, to receive advice and herbs are called botánicas.